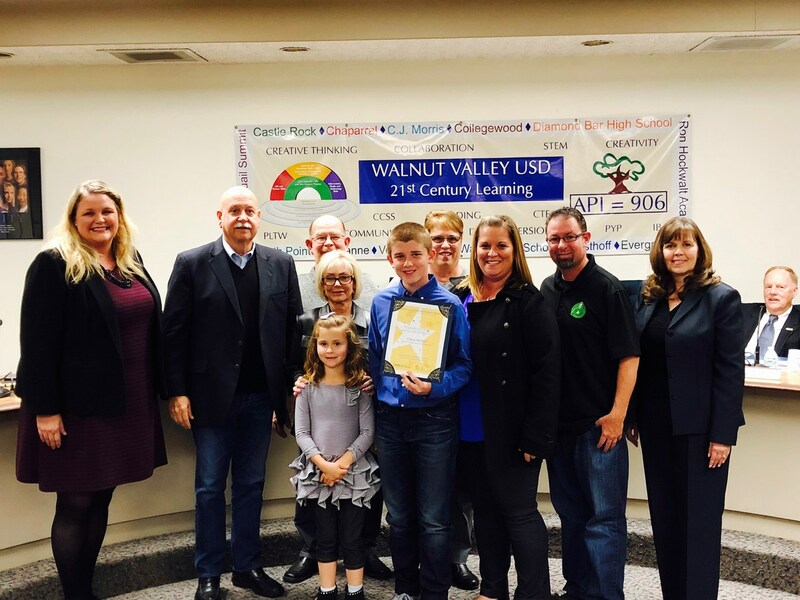 WALNUT, CA—Each month, Walnut Valley USD Board of Trustees celebrates hard-working students and dedicated community members. 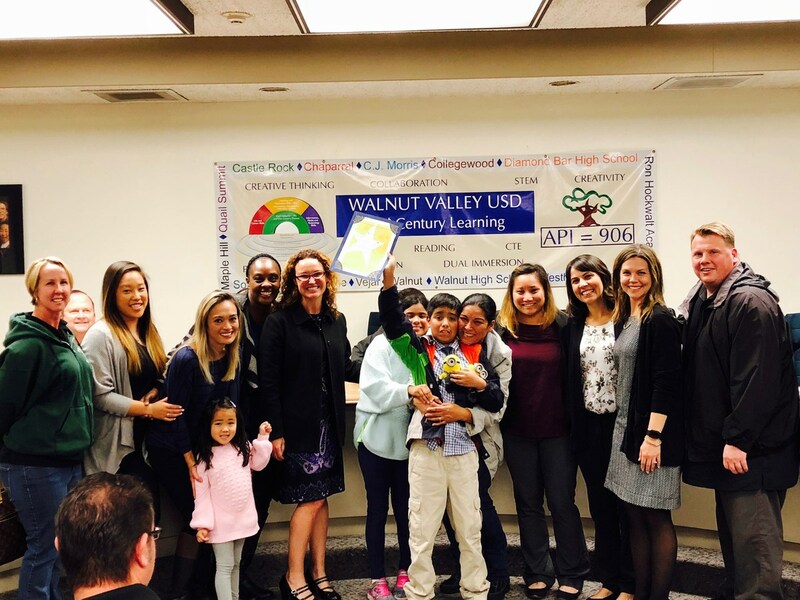 During the March 14 meeting, Evergreen and Maple Hill Elementary leaders took to the podium to introduce their hand-picked honorees. Evergreen fifth grader Luis Bartolo received the Super Star Student Award. “Luis is always so positive and friendly to everyone he meets,” said Principal Trina Dryer recalling when a first grader visited his special education class for social lessons. “Luis was chosen to walk the student back to his class and they could be seen holding hands, talking away as they walked and skipped down the hall. It truly showed Luis’s leadership and his caring for others!” she said. Luis is also brave and willing to try new things even though he might afraid and anxious, Dryer said. He recently went on a field trip to an equestrian center and was able to ride a horse successfully. And at the recent Talent Show, Luis performed a song all by himself in front of an audience of over 650 students. This is something that most people would not do! Mike Yamashiro and Ken Tragarz were honored with Partner in Education Awards. During the annual Open House, the Walnut High School Astronomy Club, under the direction of teacher Mike Yamashiro, hosts a Star Party and Ken Tragarz with the Boy Scout Troop 737 cook up peach cobbler and other desserts in Dutch ovens. “The Star Party has been a fun addition to our Open House event for the past six years,” Dryer said. Families get to look through huge telescopes at the night sky. There are usually lines of people waiting for their special turn to peer at the stars and planets. The` Boy Scouts offer their delicious desserts and hot chocolate free of charge. “They are quickly taken and eaten. I never get any!” Dryer said. Maple Hill Elementary fifth grader Ethan McNeil was lauded with the Super Star Student Award. 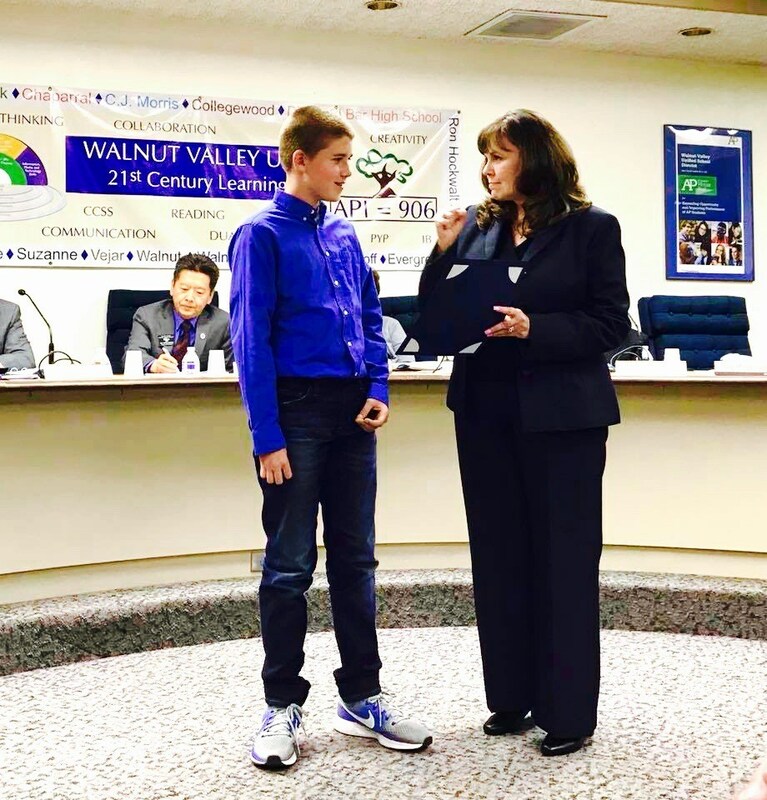 “Ethan is a legacy who has paved his own way with his kind heart, strong mind, and great spirit,” shared Principal Kelly Morris. He is compassionate, selfless, a talented athlete, and champion for kids that are underdogs. “In class, he is like a Jedi - focused, disciplined, enthusiastic, and motivated,” Morris said. When his grandfather was diagnosed with cancer, Ethan was compelled to advocate and support others affected with cancer. With his sister’s help, Ethan created a school fundraising campaign that raised $1,500 for the WVUSD Relay for Life. “Gentle souls like Ethan will be the calm force that the world needs to be a better place. And how lucky are we to be the village that’s helping to raise this stellar human being!” Morris said. Parent volunteer and “everyday superhero” Steve Samaniego was honored with the Partner in Education Award. The dedicated volunteer has run three reading groups every Monday morning for the past four years. “He has positively impacted the lives of approximately 100 reluctant readers. But more importantly, he has had an impact on their hearts,” Principal Morris said. During a 2nd grade musical, Steve was in the audience watching his daughter Vera perform, and during the opening number it was obvious that one student from his morning reading group was anxiously scanning the audience in search of his parents. At first, despair washed over his face, but within one small moment his sorrow turned into elation. 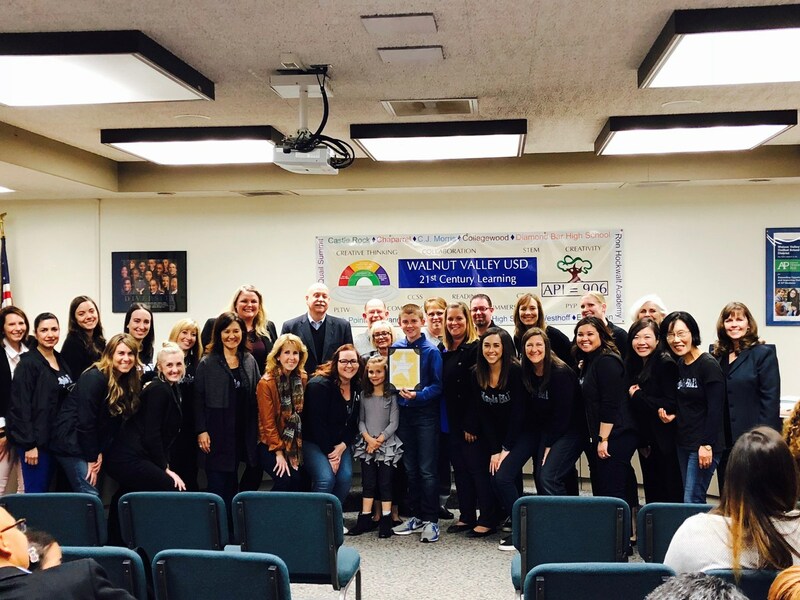 “I assumed that he spotted his parents, but when I peered over the many cameras, I saw that boy was looking directly at Mr. Samaniego who was giving him a thumbs-up, smiling ear to ear, and mouthing words of praise and encouragement,” Morris described. Evergreen fifth grader Luis Bartolo received the Super Star Student Award on March 14. 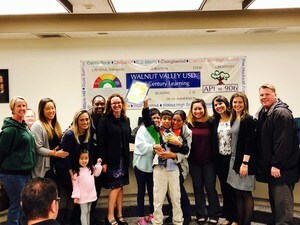 Shown with Principal Trina Dreyer, Board President Cindy Ruiz, family, and staff members. The Walnut High astronomy club was honored with the Partner in Education Award for hosting an annual Star Party at Evergreen Elementary. 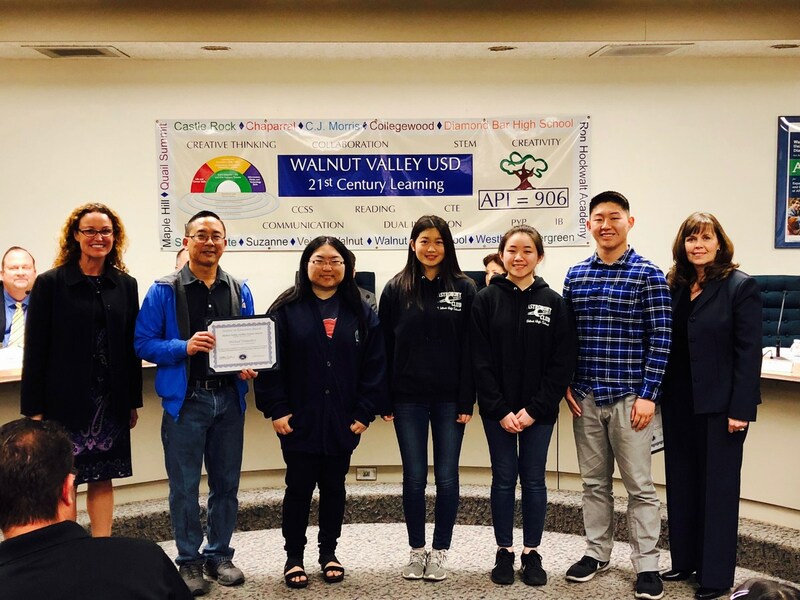 Shown with Principal Trina Dryer, Walnut High teacher and advisor Mike Yamashiro, club members, and Board President Cindy Ruiz. Boy Scout Troop 737 was lauded with the Partner in Education Award for supporting Evergreen Elementary School. 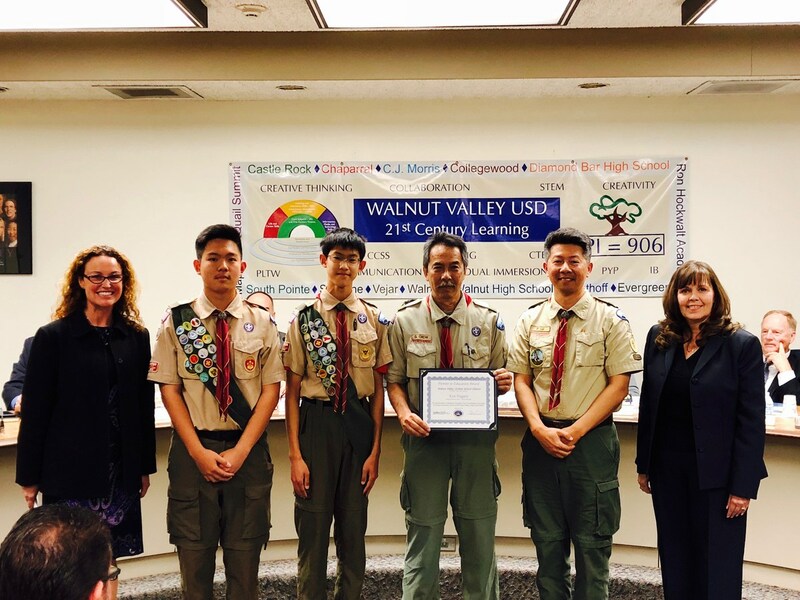 Shown with Principal Trina Dreyer, Scout Leader Gary Chow, boy scouts, and Board President Cindy Ruiz. 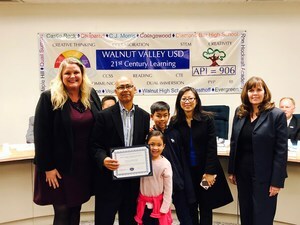 Parent volunteer Steve Samaniego was lauded with the Partner in Education Award for Maple Hill Elementary. 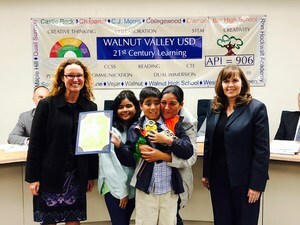 Shown with Principal Kelly Morris, family members, and Board President Cindy Ruiz. Maple Hill Elementary fifth grader received the Super Star Student Award during the March Board Meeting. Shown with Principal Kelly Morris, family members, and Board President Cindy Ruiz. Shown with Principal Kelly Morris, family and staff members, and Board President Cindy Ruiz.